Ownership is society's notion of how things relate to people. For each of us, it classifies all that is in the world into two categories: "that which is mine" and "that which is not mine". It is the exclusive right to occupy, use and control. 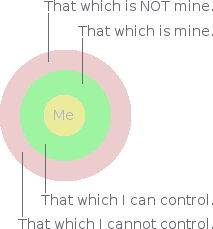 Ownership can therefore be said to define "that over which I have control" as opposed to "that over which I do not have control". Notwithstanding, ownership (and hence control) of something is never a black and white issue. It is never a case of either no control or total control. Ownership is always a matter of degree. It is always somewhere between zero and 100%. But what exactly do people in today's society own? And what does it mean? The human consciousness has a notion of self. It also has a notion of what is not self. This notion of self extends into one's external environment. Some thinkers call this the extended self. Immediately accessible to my conscious self, within my mind, are my wisdom, my knowledge, my memories, my philosophy and my imagination. Beyond these are my brain and my body. These are my inalienable possessions. Over them I have the option of total control. From here, though, my notion of self extends outwards independently along different dimensions. Along a geographic dimension, my notion of self extends to my locality, my region, my country, my continent, my planet, my solar system, my galaxy, my cluster, my super-cluster, my universe. Along an economic dimension, my notion of self extends to my clothes, my tools, my land, my home, my furn­iture, my car, my job, my business, my market. Along a social dimension, my notion of self extends to my family, my friends, my neighbours, my colleagues, my social class, my tribe, my race, my nation and humanity as a whole. It is as if each dimension of the extended self is made up of a series of concentric shells, like the layers of an onion. Personally, I do not perceive these layers as layers of an extended self. I prefer to regard everything beyond my conscious self as layers of diminishing possession. But what is the degree of my ownership over these concentric layers? Do I even own them at all in any real sense? Do I Own My Self? There is one thing that each of us owns exclusively. It is that which can assert that "I think therefore I am". It is the sentient being that each of us is. Each of us has exclusive ownership, possession and control of his conscious self. I am my conscious self. Others can destroy it by killing me. But nobody can take over control of it. It is mine 100%. In other words, I am the sole and exclusive owner of my conscious self. Furthermore, I cannot - either freely or under coercion - give my consciousness to anybody else. Notwithstanding, my consciousness is taken from me every night by sleep. And with it goes the world and anything that I may own therein. I have lost all control and, consequently, all possession. That is, until I re-awaken. My consciousness was something freely given to me at birth, although, strictly speaking, I did not really become fully conscious of myself until about the age of 7 years. Hence, my consciousness is an inalienable birthright. Notwithstanding, it is not mine forever. It will, one day, be taken from me by death. Do I Own my Mind? I (my conscious self) am aware of what is going on in my mind. But do I own my mind? Are my thoughts my own? The essence of my mind is a model or simulation of the real world. It is through this alone that I am conscious of outside reality. Who owns this model? Who possesses it? Who controls it? 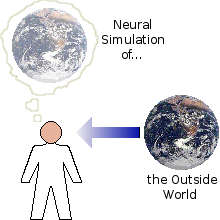 My mental model of the world is built from inform­ation that enters my mind via my 5 human senses. This information is of two kinds. The first kind is that obtained by direct perception of my immediate phy­sical environment. It is what I take in through obser­vation, experience and suffering. I use my mind to test and validate this kind of information by com­paring it with all previous observations, experiences and sufferings. 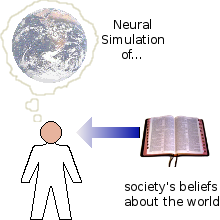 It then becomes part of my mental model or knowledge of the world. If my perception be true, the model is accurate and reliable. The second kind of information is that obtained by communication. This is what I take in through langu­age. This information is available from a vast num­ber and diversity of sources such as education, books, news media, television and the Internet. How­ever, because it arrives in the symbolic form of langu­age, it is inherently prone to error. This error can be systemic, accidental or malicious. Symbolic language is itself open to misinterpretation. The communicators of the information may be mistaken about what they are saying. Or they may be delib­erately trying to implant within my mind a belief that is false. Consequently, to preserve my rightful ownership and possession, I must wage a constant battle to repel those who would invade the precious territory that is my mind and hi-jack my beliefs and values. Real and potential hi-jackers include rel­igions, educational institutions, governments, commercial interests and dominant public opinion. So perhaps I do not own my mind 100%. Perhaps others have, in part, already distorted it to suit their own malicious ends. I am, however, free to wage the battle for my mind. I have the power to expel from my mind those who would seek to invade it. I can win the fight to protect my inner thoughts, ideas, beliefs and values. But I must have the will and determination to do so. I have this will and determination. I am fighting the battle. I have been fighting this battle all my life. Freedom of thought is an inheritance with which every human being is born. My brain is my exclusive territory. Sadly, the vast majority of people quickly relinquish ownership of this precious birthright. They do not fight to keep possession. They allow out­siders to invade, conquer and control what is rightfully theirs. While young, they let teachers plant unverified ideas in their minds. They are vic­tims of education systems that demand the unconditional acceptance of what is taught, denying them time to discuss, prove and understand. They are indoctrinated with unjust ideals founded upon politically biased histories. As adults, their freedom of thought is eroded and stifled by the incessant drip-feed of the politically-influenced mass-media. The passive majority thus lose the inheritance of free thought with which they were born, and with it, the potential to regain their rightful inheritance of the Earth. Do I Own my Body? My brain is the vessel of my mind. My body is the vessel of my brain. Do I own my brain and my body? I - my conscious self - have direct control of my brain through which I can cause my body to do whatever I want it to do, within the limitations of its physical capability. Nevertheless, there are two ways in which others can usurp, or steel, my rightful exclusive control of my own body. The first is by physical force. Several armed human bodies can act in coordination, combining their strengths to overpower me and physically force my body to go where I do not want it to go. They can also shackle me so that my body cannot move freely. They can then do to me what I do not want done to me. They can inflict imprisonment, pain or death upon me if I do not make my body do what they want it to do. Nevertheless, they cannot force me to make my body do what I do not want it to do. The second is by coercion. My physical body is not self-sustaining. It needs inputs - water, food, clothing, shelter - from the Earth's biosphere in order to sustain its ex­istence. So if my body does not receive a continuous supply of its needs of life, it will die. Consequently, so will my brain. My mind will cease to function and my con­sciousness will become permanently extinguished. In a natural situation, I can obtain my needs of life directly by applying my own labour to my fair and rightful proportion of the resources of the Earth's biosphere. But in order to be able to do this, I would need to own (and hence have exclusive economic control over) my fair and rightful proportion of the resources of the Earth's biosphere, which I don't. The reason I don't is because ownership of all the resources of the Earth's bio­sphere is divided among the members of a small Elite. Hence, I can obtain my needs of life only by leave of a member of this small Elite. Notwithstanding, he will not simply give me my needs of life. I must buy my needs of life from him. The only thing I have to trade is my labour. Hence, I must work for him in exchange for my needs of life. He thus commands my labour. He controls what my body (including my mind) does or does not do during my hours of work. Ownership is control. Hence, during working hours, my body and my time are owned by him. So, under the socio-economic system within which I am constrained to live, I do not have exclusive ownership, possession and control of my own body. That is, assu­ming I wish to continue living. If no member of this small Elite wishes to buy my labour, I either starve or throw myself upon the charity of the State. Do I Own my Things? Ironically, I own my clothes more than I own my body. I have ex­clusive use of them. I decide which I shall wear and when. Neither the State nor the Local Authority where I live dictates what I shall wear and when. The State does, however, require that I wear something. I am not allowed to go out naked in a public place. An employer may require certain standards of dress during working hours. He may require that I wear a suit or some kind of pro­tective special-purpose clothing. So although clothing is perhaps the possession over which I have most control, I still do not have total control. Hence I do not have total ownership. I own the furniture and appliances in my home more than I own my clothes. 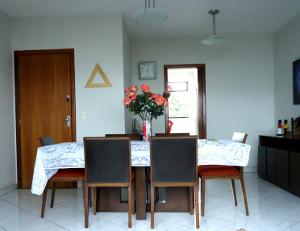 Although I share their use with others in my household, they are not controlled in any way by any outside power. Except, when I lived in the UK, the television receiver. I am permitted to possess and use my own television receiver only provided I have paid quite a painful licence fee. If I possess or use a television receiver without having proof that I have paid the annual licence fee, I have committed, according to English Law, a criminal offence. Thus, in the UK at lease, ownership of a television receiver is only a partial ownership. I could buy - and thereby own and possess - a car. But here again my ownership is only partial. I may drive the car outside my own property only provided I have paid the necessary licence fee. I also have to pay VAT (value-added tax) on the fuel I use (plus, in the UK, an illegally-imposed fuel tax). I must also obey stipulated traffic rules and put up with the stress caused by the law-breaking and aggressive actions of other road users. So a car is something that can only be owned in part and with conditions. I could buy a house and spend the best part of my life paying for it. But would I ever really own what I have spent my life paying for? The degree to which I can own my house is even less than the amount to which I own my clothes, furniture or car. I cannot remain in my own house unless I can pay the property tax (or rates) that the local municipal authority decides to levy on it. That is not ownership. I am in reality - having spent the best part of my life paying for it - only renting it. I may not change the outside appearance of my house without first obtaining the expensive permission of the local authority. I am also severely restricted as to what I can do inside it. Legally, I can only use it to live in. If I use it as the base where I work, I am using it for a "non-residential purpose", which is illegal. That is not exclusive control of use. That is not ownership. I do not and cannot own my house, no matter how much or for how long I pay for it. Suppose I own some land. Is it really mine? Do I have possession of it? With land, possession and ownership are very different concepts. The subject is very comp­licated and I have covered it in detail elsewhere. Briefly, though, to own a piece of land, I must pay the seller (or previous owner) a large amount of money. From then on, I must pay the State an annual tax. But having done these, my ownership is very fragile. I can do practically nothing with or on "my" land without obtaining expensive detailed permission from a State or muni­cipal authority. I cannot build on it. I cannot drill for and draw water from beneath it. I cannot take minerals from beneath it. I cannot cut down trees that may be growing on it. I may simply occupy it and, provided I am condescendingly granted permission, I may be able to grow pre­scribed crops or raise prescribed animals on it. That's not ownership. It is merely the renting of permission to carry on specific restricted kinds of approved activity. The real owner is the State. For the ordinary individual, ownership is thus an illusion. It is a construct that de­ceives people into thinking that they are proprietors of their own houses, cars, appliances, furniture, bodies and minds. But they aren't. Possession and use of practically everything is controlled and charged for by the State. But who or what is the State? The State is a bureaucracy that controls society and the econ­omy that supports it. It determines and enforces the rules under which society and its underlying economy operate. But a bureau­cracy is not a sentient being. It cannot think. It has neither brain nor body. Only human beings can formulate rules and build structures for enforcing them. Who are these human beings? They are the small dominant elite minority of the super-rich. They pressurize and lobby elected governments to devise legislation that favours their interests. This elite minority purchases the services of the mass-media to brainwash the masses into believing in, and voting for, policies that favour elite interests. They have the wealth and influence to acquire whatever permissions they need to expedite their wishes. They are the true owners of all the Earth and all who dwell thereon. If ownership be control, then the middle majority in a developed country do own, at least in part, the things they need in order to live their limited suburban lives. The Elite, on the other hand, own vastly more than what they need in order to live a rich, full and diverse life. Consequently, the part of one's event horizon that can be designated "that which is mine" comprises two levels. The first is "that which constitutes my necessities of life". The second is "that which constitutes my luxuries and extravagances". But where does the boundary lie that separates necessities from extravagances? Isn't its position somewhat subjective? Perhaps a valid guide is what each would have if all the Earth's re­sources were divided out fairly among all its inhabitants. This would amount to two hectares of habitable land, including all that is upon and within it, and without obligation. Some land must be left for free and universal use for travelling around from place to place and for nature to have free reign. 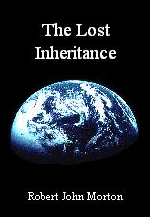 Suppose half is left free for these purposes so that each individual has ownership of just one hectare. On this basis, when two join to make a family their combined right would be again two hectares. This is the amount of land which from ancient times has been considered to be that needed for a family to sustain itself. Using this measure as the standard for necessity, then in this present age, all but the elite minority have been grossly short-changed. The elite minority own all the life-sustaining resources of the planet. All human be­ings can sustain their biological existences only if they can consume these life-sustaining resources at a sufficient rate. Consequently, the elite minority controls whether or not the vast majority continue to live or die. Thereby the elite minority own the vast majority. The State - the instrument of the elite minority - has prior claim over my body, my clothing, my land, my home and its contents. It requires me to work for my needs of life. It thereby holds claim to my time and effort. Yet it accepts no responsibility to afford me the opportunity to work for an income of dignity on which to live. It merely provides the means for me to exist so that I may be available for work or war. I am the subject of its pleasure. I am its possession. The limited-liability corporation - the instrument of the elite individual - has prior claim of the body, clothing, time and effort of an employee. As such, it owns the best part of his time and effort, and thereby, the best part of the employee himself. Yet the corporation too, accepts no responsibility to pay him an income of dignity on which to live. The State must often use money taken in taxes to subsidise corporate payrolls so that employees have sufficient on which to survive. This principle of some people owning others is ingrained within the fabric of society, right down to its most basic elements. The original principle on which marriage is based requires that the wife's body and obligations be her husband's exclusive possession. She is under his control. She may not relate with anybody else. She is her husband's property. This principle survives even today in that societal undertones still impose a tangible awkwardness upon the notion of a separately married man and woman being one-on-one friends. Whomsoever is owned is a slave. Whomsoever does not control sufficient means for turning his work into his needs of life is a slave. All but a minuscule minority of human beings are slaves. We need to become free. We have the self-evident inalienable right to be free. We are many. They are few. Let us take our freedom.